Boston University’s new club AR/VR, a student organization focused on exploring the emerging technologies surrounding augmented and virtual reality, held its first meeting on Sept. 13, with 40 interested students in attendance. Although this is BU AR/VR’s first year as a student organization, the group’s student leaders have been planning for some time. A large factor that led to the group’s formation this semester was co-founder Alicia Hong hearing about a virtual reality course taught last summer at the Massachusetts Institute of Technology. The class was open to students from all over the Boston area, including those from Harvard University, Tufts University and the University of Massachusetts. However, Hong said that BU was absent from that list, and Hong, a second-year graduate in the College of Communication, could not attend the class. James Cummings, the co-director of the Communication Research Center and the group’s faculty sponsor, explained further. BU AR/VR holds weekly meetings from 6 p.m. to 7 p.m. at 111 Cummington Mall. At the meetings, members get hands-on time with the technology and get to experience the hardware first-hand. BU AR/VR invites members who own headsets and technology, which include a Samsung Gear VR headset and a Microsoft HoloLens, to share with the group. Many of the other club members have never had such resources at their disposal. The meetings also include talks and lectures intended to spark discussion about the technology and its future. Hong spoke at the first meeting, outlining her research on the social science of VR technology. Chandler Zhang, a co-founder of the club and a College of Engineering senior, said these meetings and discussions are vital to the group’s success. The group has plans beyond the weekly meetings as well. A poll in the organization’s Facebook group, which includes more than 130 members, showed that the most appealing thing to members was the promise of workshops that would help them develop their skills in understanding and programming for VR. The group plans to have workshops on Unity, a prominent game design engine, 3-D modeling and VR gaming. The group plans to host upcoming talks from BU alumni who now work in the industry at Amazon, Wayfair Inc. and PTC. They additionally have plans for trips to Boston area startups working with VR and AR technology. 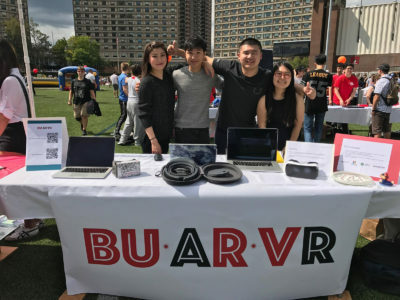 One of Zhang’s goals is to grow BU’s AR/VR community outside of the confines of the university. 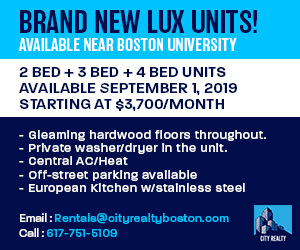 He said he hopes by next semester to have BU students attending and co-hosting events with other universities and businesses in the Boston area. BU AR/VR’s eventual goal is to get members working on their own projects. The organization has teamed up with a number of consultants to try and help facilitate creativity and experimentation. Zhang described how if a member comes to them with a great idea, they hope to pair them up with members of similar interests and then assign that group a consultant. The consultant will work with them answering any questions they may have in their attempt to turn their idea into something tangible. “It’s one of the most enticing things for me,” Yellen said. He described how it takes the pressure off of busy students who don’t necessarily have the time to learn this on their own. That is the group’s primary focus, according to its founders: getting the technology into students’ hands, and curating an environment at BU in which members can learn and create for this exciting emerging technology. Johnathan – So glad that Ben told me about this article. It sounds like you are well informed on the subject and you have covered it completely. Really well written. I enjoyed it thoroughly! !